Wildly successful and multi-award winning, Catan (5th Edition) (formerly The Settlers of Catan) has sold over 18 million copies worldwide. A socially interactive game, it is a great way to spend time with friends and family! As new residents on the island of Catan, players compete to develop the most advanced community. Each round, you roll dice to determine which resources the island will produce for you (wood, brick, wheat, wool, ore). You may freely bargain and exchange resources with other players - And this trade is necessary to survival! You then use these resources to build roads, settlements, cities, and other developments. By building, you hope to attain 10 victory points before any other player, to win the game! 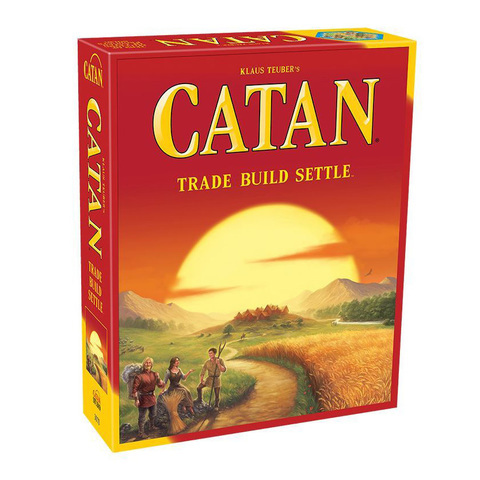 Catan (5th Edition) ranks as a classic among European board games with its elegant and unique design. It utilizes a modular gameboard that changes with every play, constantly bringing fresh experiences to the game table. You won't see the same island twice! Enter the world of Catan and experience this international favorite today.